Carpenter ants are one of the most common insect pests found in homes, and its infestation is a more serious problem than many people realize. 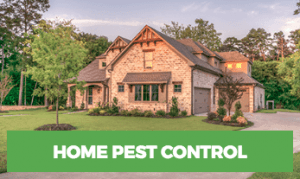 A carpenter ant infestation can lead to structural damage to your home. This is because that carpenter ants live in the wood of your home. As they make their nests, they burrow through the wood. They don’t eat the wood, but the effect is the same–they can undermine the structural integrity of your house. 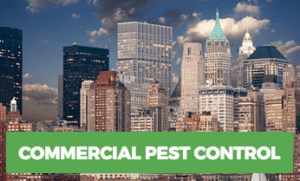 When you have a carpenter ant problem, call your local ant exterminator company. Carpenter ants vary in size and color but are usually large, from one-quarter to one-half inch in length, and blackish. Their antennae are elbowed and their bodies are constricted between the thorax and the abdomen. Although these ants aren’t wood-eaters like termites, they do have to eat. So you can take steps to prevent a carpenter ants infestation by watching what food you leave out. Carpenter ants live on sources of protein and sugar. If they are outdoors, they usually eat living and dead insects. But if they are inside your home, they feed on meats for protein and syrup, honey, sugar, jelly, and other sweets for sugar. If you’ve ever spilled something sweet and not realized it, and then come back to find a trail of carpenter ants crawling all over the sticky spill, then you’ve witnessed carpenter ants attraction to sugar. Carpenter ants typically go in search of food between sunset and midnight during the spring and summer. They can travel up to 100 yards from their nest in search of the meal, so if you leave out meat scraps or sweets, you’re inviting the carpenter ants into your kitchen. Carpenter ants will establish their nest in moist areas where wood is likely to be soft or already decaying such as behind sinks or dishwashers or in roofs or attics near broken vent pipes or chimneys. Their nests can also be found inside hollow doors, in electrical outlet boxes, and even hollow curtain rods. Carpenter ants get into homes through entry points such as attic vents, foundation cracks, electric wires, and pipes. And once one colony is established, satellite colonies often form. 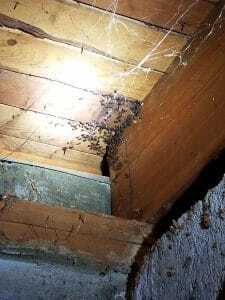 If you see piles of sawdust-like material underwood, hear rustling or crackling sounds in your walls, or see winged ants inside –the members of a colony that reproduce–, chances are your home is infested. 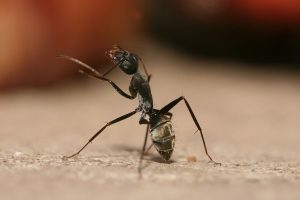 If you understand the structural damage to a home that carpenter ants can cause, you may be wondering “Do I have carpenter ants?” It’s a wise question to ask because treating these ants early in an infestation can lessen the damage, while untreated colonies of carpenter ants can inflict serious damage. Carpenter ants don’t digest wood as termites do. Rather, they burrow into it because they like to nest in it, and they are attracted to the soft, moist wood of homes. As they tunnel their way through the wood, they leave behind a substance known as frass, which looks like sawdust. Visible carpenter ants are obviously a sign of possible infestation. However, these ants travel far from their nests as they forage for food, so the ones you see could be from nests outside the home. If you’re near a nest, you can sometimes hear a crackling sound from the ants’ activities. A typical colony has thousands of ants. 4. Rustling noises inside woodwork or walls. This sound is from the ants moving about in their burrowed nests. A stethoscope or empty glass can help you hear these faint noises. With the opposite end of a screwdriver (the soft part), gently tap on walls, joists, rafters, and other wood to check for this sound. This is a sure sign of a colony—and likely satellite colonies. The winged ants are the colony members that reproduce. If you see these “swarmers,” you have a problem. Having a carpenter ant problem can be a harrowing ordeal. Although they’re typically not as destructive as a termite colony might be, they can definitely cause considerable damage if left unchecked. Carpenter ants are a somewhat insulting breed. After all, at least termites eat your wood in order to survive. But these ants only wish to burrow through the wood, discarding its remnants along the way. They’re simply throwing away your house one mouthful at a time! 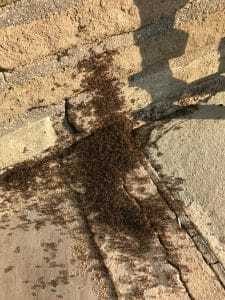 This may not seem like a lot, but after you see how fast an ant infestation can spread, you will realize how big of a deal this can be. Maintaining a clean home is your first line of defense against carpenter ants (and other ants, in general). Ants are attracted to any food that you’ve left lying around the house, whether it’s a piece of fruit on the kitchen counter or a fast food wrapper on the floor of your bedroom. Discard garbage right away, and if it has a strong odor, be sure to take the trash outside. Also, take special care in cleaning your floors, and fix any leaky faucets to prevent rotting wood from attracting the ants. All ants, including the carpenter variety, are likely to enter your home through cracks and gaps in your foundation, door frames, window frames, etc. To prevent a carpenter ant problem you need to seal those holes. To do this, follow a very simple guideline. If the cracks and gaps are small, use caulk to fill them in. If they’re medium-sized, expandable spray foam will do the trick. And for larger issues, you’ll want to go with weather stripping. Ant bait can be one of the most effective ways to prevent a carpenter ant problem. If you realize that you already have ants, they can work wonders in getting rid of them. But you can also use them as a preventative measure. If your area is susceptible to the little buggers, strategically set up some bait traps around your home. Any ants that come across them will take the bait back to the colony and the poison will slowly eliminate them. If you’re looking for a way to be a bit more active in the prevention of a carpenter ant problem, seek out and find their colony. There’s a good chance that the ants haven’t strayed too far from home. This is especially easy if you already have a line of ants in your home. In that case, all you need to do is follow the line to the colony. Once you find it, use a product designed to seal the hole and kill the ants inside. If caught early and treated by pest-control experts, carpenter ants can usually be removed before significant damage is done. And even if damage has already occurred, prompt attention to the problem will minimize the problem. They won’t just go away!